You may be a veteran Black Friday shopper with the inside scoop on the greatest deals and strategies — but how much do you really know about the day itself? For example, did you know that certain retailers create low-quality versions of their products to sell on Black Friday? Or, can you name which generation goes nuts on Black Friday (nearly three-quarters of its members participate)? Sure, you knew Black Friday was popular, but did you know it was this popular? Last year, 102 million people shopped during Black Friday weekend. That’s roughly 32% of Americans. Wondering how to stay sane amidst the hustle and bustle? Start by reading this. You’ve probably joked about toy rage and trampling before, but the scary, sad fact of the matter is people actually have died shopping on Black Friday. In the past 10 years, seven deaths and 98 injuries have been attributed to Black Friday, Black Friday Death Count reports. If you’re nervous about battling it out in the stores, then Cyber Monday might be more your scene. You probably heard “Black Friday” originated from an accounting term: the day retailers’ profits finally went into the black. But, the name really came from Philadelphia cops who were frustrated with traffic and smog caused by the mass of shoppers. Retailers didn’t like the negative connotation, so they spread the accounting rumor. In search of more truth bombs? Check out this list of busted Black Friday myths. 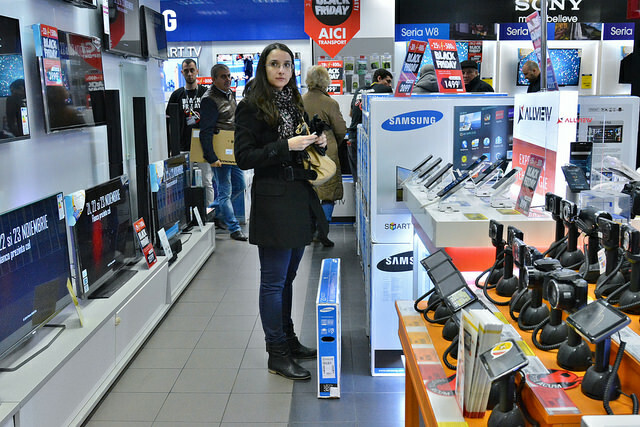 Spot an amazing deal on a TV, laptop, tablet or other electronic device? Proceed with caution: It might not be the real thing. “Some products advertised at deep discounts on Black Friday are what’s known as ‘derivative products’ — items made by the same manufacturer that look almost like the standard model but with a few very important differences,” Time reports. To determine if you’re getting a derivative, Time recommends checking the model number, which will differ slightly from the regular product. You can’t be too careful when it comes to your money: Before heading out on Black Friday, arm yourself with more tips from the experts. Can you believe it? Shoppers spent an average of $299.60 on their Black Friday shopping last year, according to a survey from the National Retail Federation. Don’t let your holiday shopping get out of control: Create a Black Friday budget before doing anything else. Eek! You’ll find plenty of bargains on Black Friday, but don’t automatically assume everything is at its lowest price. The cheapest day of the year may be later in the holiday shopping season. With that in mind, here’s a list of items you definitely shouldn’t buy on Black Friday. Would you have guessed millennials are the generation most devoted to Black Friday? We wouldn’t have. Last year, a surprising 53.8% of 18- to 24-year-olds and 62.1% of 24- to 35-year-olds shopped over Black Friday weekend. If you’re part of this tech-savvy, bargain-hungry crowd, here are 15 apps to download for Black Friday. It may no longer be the busiest day of the year for retailers, but Black Friday still reigns supreme for another industry: plumbing. “Often, the case is that a house already has partially clogged drains that go unnoticed, until holiday guests arrive and overwhelm the system,” explains Roto Rooter. Want to earn money on Black Friday, instead of spending it? Advertise your handyman services in the weeks leading up to the holiday. If you only go for the bargains — and not for the Black Friday experience — you might as well stay home and shop online. Last year, more people planned to shop online than in stores over Black Friday weekend. If you, too, are going to shop from your screen, save money and headaches by downloading these browser extensions. Your Turn: Did any of these facts surprise you?